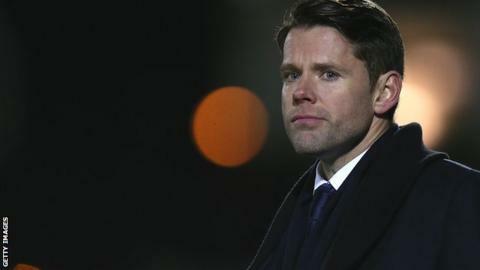 Accrington have avoided a £15,000 fine after manager James Beattie passed his Uefa B coaching licence on Wednesday. Stanley were fined £20,000 in January after a Football League commission revealed the 36-year-old did not hold the necessary qualifications. But £15,000 of that was suspended, provided that former England striker Beattie acquired his licence by 1 May. "It's a course that usually takes nine to 12 months and I've done it in 12 weeks," Beattie said. "And I've done it while still trying to keep the football club in the league. "It's a weight off my mind, not that I wasn't confident of passing it, but it's just the workload that it entailed was quite large," he added to BBC Radio Lancashire. All managers in League One and League Two are required, under regulation 40, to have a B licence and begin working towards an A licence within three years of their appointment. The rules also state that managers in the Championship must hold an A licence and be working towards a Pro licence, Uefa's highest coaching qualification. Beattie, who was appointed in May 2013, has led Accrington to League Two safety with a game to spare.